3/18/2013  Kilroy Was Here first recognized this forgotten hero from a forgotten war last year in 2012. 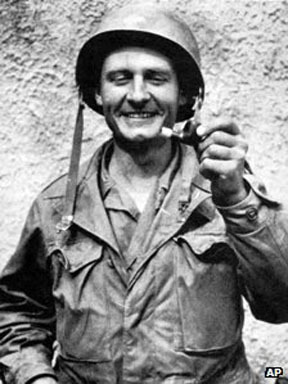 Father Kapaun, like other forgotten heroes of this war waited more than 60 years to be remembered. On 11 April 2013. President Obama will present the Medal of Honor posthumously to Father Kapaun through his nephew Ray Kapaun. 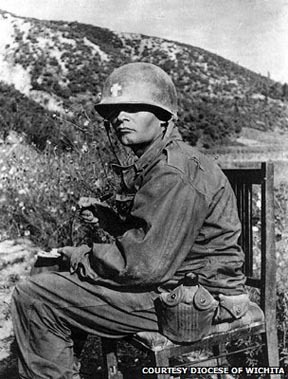 He is the only seventh Army Chaplain to receive the Medal of Honor since the first in 1861. A forgotten place in freezing North Korea  1 November 1950. 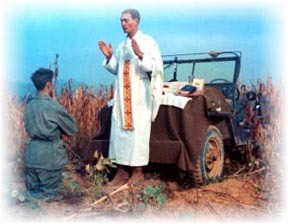 A young Roman Catholic Chaplain celebrated four masses in his 3rd Battalion of the 8th Cavalry Regiment then crawled in his pup tent near Unsan for long overdue rest. He was a veteran of WWII in Burma and India and volunteered for Korea. Though he never fired a shot, Father Kapaun saw as much mean action as any man in his unit. He and his 3rd battalion bedded down in apparent safety; the North Koreans were on the run after the long push up from Pusan. With good reason, most thought the war was as good as won and they would be going home soon . . . maybe in time for Christmas. Douglas MacArthur's message passed mouth to mouth: "Get us to the Yalu by Thanksgiving and you will all be home for Christmas." The only possible concern was . . . would the Chinese enter in war? The generals had already insisted that the Chinese would not; so, to sleep. There were, however, clues that foreshadowed what was about to happen. A patrol went into the hills and listened to enemy officers on their radio. When asked, a South Korean replied that he didn't know what the enemy was saying because they were speaking Chinese. Intelligence officers scoffed. Other patrols reported that civilians saw "tens of thousands Chinese" in the surrounding hills. Intelligence officers scoffed. On November 2nd the Chaplain didn't know it but the 1st and 2nd battalions were already being overrun. They, the 3rd, were next. It was in a pitch black early morning darkness when they heard a new kind of noise that sounded like a bird call. "That's no bird call! We are in for it! "* Soon they saw hundreds of figures moving toward them. .A bugle blew  far too close, and another, then strange ghostly calls from sheep horns blown by Chinese. Machine guns and mortars soon began firing. Weird music broke out along with war songs from bugles and thousands of charging troops. These troops were not pajama clad "volunteers" as China claimed but well equipped, well-trained regular troops; battle hardened by war with the Japanese and a bitter civil war. Suddenly alert, GIs fired flares into the night sky. OMG! The could then see twenty thousand Chinese soldiers charging right at them. under fire,all the while dressing wounds. Men screamed at him to run, but he ignored them. "I'm going to give you guys the last rites," he said "because a lot of you guys are not going to make it home." He called out the sacred words in English, not Latin. Even as late as November 4th after the 1st, 2nd, and 3rd were overrun and while the 8th Cavalry was being crushed, reports from the 8th about Chinese were met with "There are no Chinese in North Korea." coming in mass charges. This type of charge was given up by Europeans by WWI and the Japanese by Iwo Jima. But unlike Iwo Jima where the Japanese no longer had the manpower to lose  the Chinese did. captured, wounded Chinese officer. He offered surrender and appealed to Chinese humanity. The officer yelled outside. The Chinese stopped shooting at the dugout. They took him and 15 or so of the wounded and agreed not to shoot the rest. His negotiations probably saved 40 lives in the dugout. Most of the survivors of the 3rd were captured. They thought this was the end and that they'd be shot now. 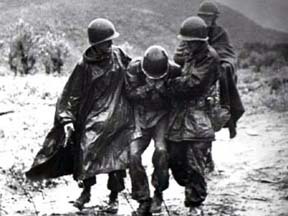 The enemy in Korea frequently murdered prisoners. Korean winters are bitter cold where temperatures reach 40 degrees below zero Fahrenheit. Even so, the remnants of the 3rd survived a death march. All noted that anyone who couldn't walk and was left behind would be shot. The Chaplain carried one all the way. The Chaplain led secret prayer groups. If they caught him, which they did sometimes, it meant time in a punishment hole, or standing on ice for hours while stripped to the skin. All the time, he dug latrines, mediated disputes, gave away his own food, raised morale among the prisoners, and smuggled dysentery drugs to the aid station. Sadly, the Chaplain developed a blood clot in his leg, dysentery, and pneumonia. Emil Joseph Kapaun (April 20, 1916  May 23, 1951) died in much the same painful way as many of his beloved flock at the prison camp in Pyoktong, North Korea. He was buried in a mass grave near the Yalu River. Have you ever heard of him? He has been nominated for the Medal of Honor and is in line to be made a saint by the Vatican. The forgotten saint of a forgotten war! 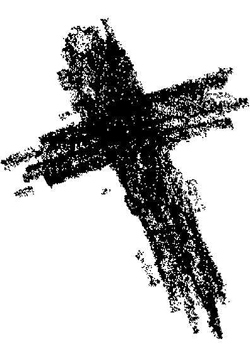 crucifix stumbled out. They had risked their lives in a final act of defiance to bring those items. Upon reaching freedom, they went directly to foreign correspondents covering the prisoner release and said they had a world-class story to tell. 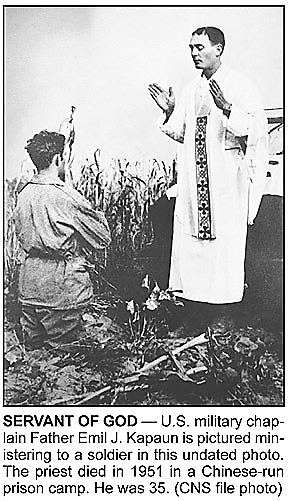 Within hours, wire services were sending it worldwide: the story of Father Kapaun, along with photos of Nardella, Joseph O'Connor and Felix McCool holding the crucifix. They told how he'd had tobacco pipes shot out of his mouth as he dragged wounded off battlefields. They said he saved men on the Death March, washed the underwear of the sick, made pans out of roofing tin, and stole food. The Vatican is now examining whether a medical healing that took place in Sedgwick County, Kansas, can be considered a miracle by the Roman Catholic Church. 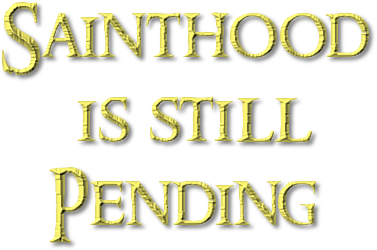 See links below for other miracles being considered by the Vatican. He is on the road to sainthood and would be the third American-born saint. The Roman Catholic Church has declared him a "Servant of God" and he is a candidate for sainthood. In 2000, U.S. Rep. Todd Tiahrt (R-Kan.) began a campaign to award the Medal of Honor to Kapaun. Prior to leaving office on 16 September 2009, Secretary of the Army Pete Geren sent Tiahrt a letter, agreeing that Kapaun was worthy of the honor. Admiral Michael Mullen, chairman of the Joint Chiefs of Staff, also agreed. Fr. Kapaun with shattered pipe. 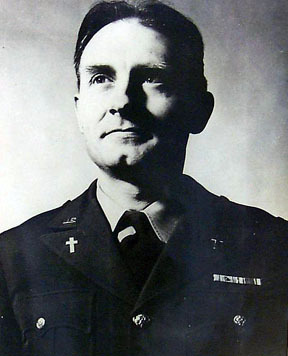 (Senate Bill 1867, Section 586) contains an authorization and a request to the President to award the Medal of Honor to Emil Kapaun posthumously for acts of valor performed by him during the Battle of Unsan on November 1 and 2, 1950 and while a prisoner of war until his death on May 23, 1953 as a chaplain in the 8th Cavalry Regiment during the Korean War. and sign the petition to get a Kilroy Was Here commemorative stamp as one last and lasting tribute to the men who fought the WWII and Korean Wars.